Beauty Career Goal Setting the Super Duper Easy Way! Goal Setting can be super easy. "8 Moves to Achieve Your Beauty Career Dreams" will amaze you. Ever wonder how some people keep making progress while others just seem to spin their wheels? Maybe it's because they have a plan of action driven by their goals! Your beauty career will take off with just a little effort now and pay off big later. Is it Really Necessary, Though? Well it all depends. How badly do you want to live your dreams? Are you a person who enjoys daydreaming or are you a person with dreams you intend on living? 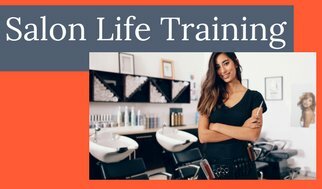 If you are here I'll assume you are the person that wants to live their life in the best way possible, that you want to make a living doing the thing you are passionate about and that you want to be the best hair stylist in your field. Now that we've established that let me give you a little proof that this stuff actually works! Business career, beauty career.....doesn't matter. 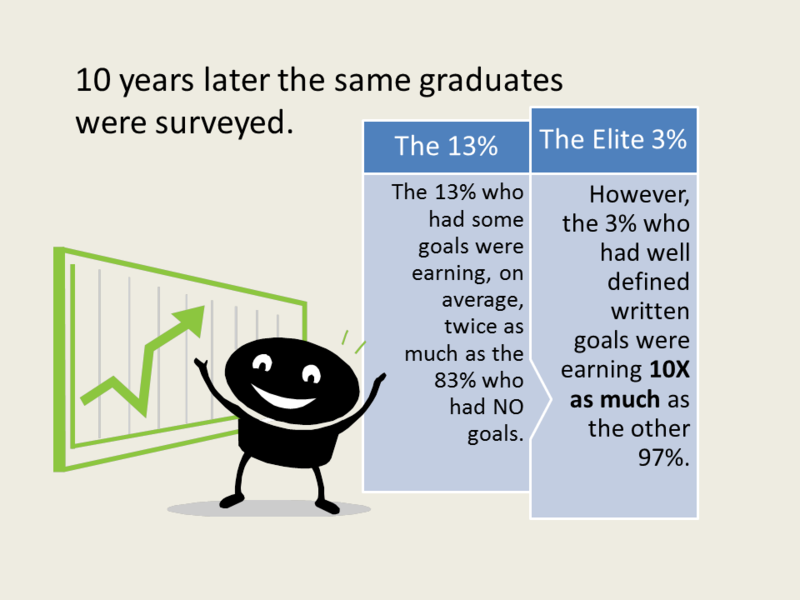 Goal setting works for anyone. Cosmetologists, if that isn't enough incentive for you to goal set your beauty career I don't know what is! When we hear the words “goal setting” people usually roll their eyes and go yeah,yeah, here we go. It doesn’t sound like fun. So it is easy to just blow it off. Goal setting is necessary if you want your beauty career to go in a specific direction. If you don’t determine where you want to go, your beauty career is at the mercy of the forces that be, whether it be management, relationships, etc. You will be like a boat cast to sea with no oars and no captain. Where would you end up? Heaven only knows. When you go on a cruise though, the ship has a captain and the captain has a map and a crew. You will get to the Bahamas because the captain has the plan, the course to take and the power of the ship to get you to the destination. You need a plan! Don’t drift aimlessly through the industry. 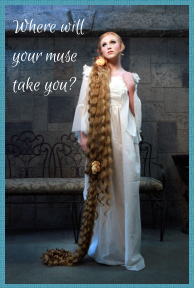 Your beauty career is at stake. Set a course now so you can fulfill your destiny. I Promised You Easy, Didn't I? I did promise you an easy way to goal setting and I won’t let you down. Fortunately, creativity is on our side. Being a cosmetologist, you have a natural gift for creativity. You are about to tap into it. Get a fresh notebook out and get ready to dream! As a professional cosmetologist I want ____________ for my beauty career because___________________. You can always change your mind so don’t panic. You have to start somewhere. It may be that you just started school and it seems like forever before you will be done and starting your beauty career. In that case you could set your goal like “As a cosmetology student I want to finish school as soon as possible because I am ready to begin my career and make money.” Setting that goal and focusing on it will benefit you by keeping your eye on the prize. 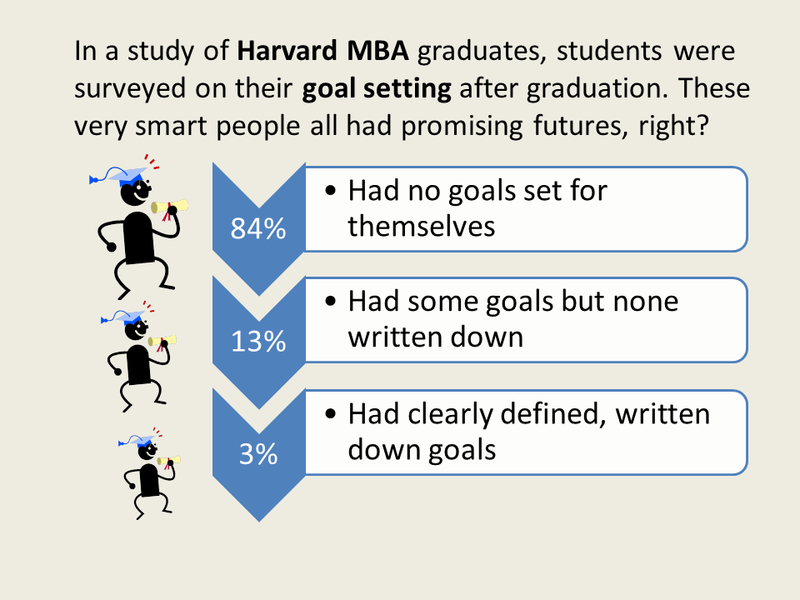 Without a clearly defined goal you may get off course like finding yourself skipping classes and setting you back. To start off on the right foot get a sheet of paper and write out every beauty career goal you have for yourself. Keeping a separate notebook only for your goals is even better. I love doing this and crossing off the ones I achieve. This gives me a true sense of accomplishment. And over time it shows you how far you have come. Imagine starting the goal notebook when you begin school and looking at it a few years later after you have a beauty career. It would make you feel great about yourself. 1. Define your Goals– You would think it is easy to write down what you want but it's been my experience that we don't always know what we want. So take your time thinking about this. There isn't a time limit. Get that notebook and start by free-thinking. Write down everything that comes to mind that you want for your professional beauty career, all the way down to the details like location, the type of people you want to be around, what you would like to wear, etc. The more specific you are the better this will work for you. Think about what really makes you happy. Do you need an environment that is highly structured or do you need an environment that will let your creativity run buck wild? What skills do you want to grow? How far do you want to climb, professionally? How much money would you like to make? All the things you come up with are goals for YOU. Don't concern yourself with what others want for you or expect from you. No one else ever has to see any of this so let your dreams loose. Dare to dream big. Feel the exhilaration it gives you to visualize yourself living these dreams. 2. Write Your Goals Down in Very Specific Terms – Take that notebook full of free-thought and begin writing down each goal on its' own sheet of paper. Give each one a time frame. And here is a classic trick for us goal setters: Use the I AM statement. Instead of "I want to _____, turn it into "I am ____ ." This shifts the brain from a state of desire into a state of having or being. This trick will help you reach your goals faster. 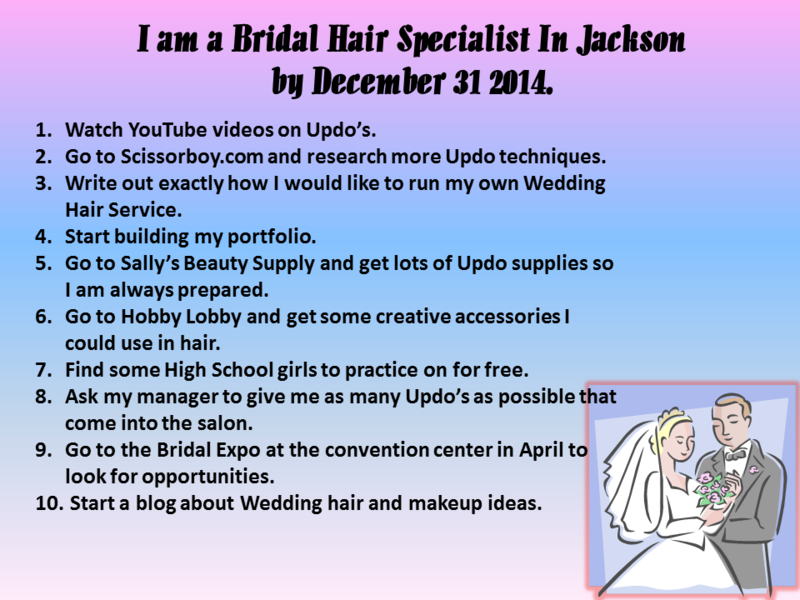 For example, Paige could write, "I am the best hair stylist in bridal design in Jackson, TN by December 31, 2014." "I am a successful Bridal Artist, doing only wedding parties, and making $60,000 a year by December 31, 2016." Notice how she gave herself time to grow into the Bridal Artist that makes $60k a year? If she had written down that she achieved it 2 months from now it wouldn't have given her time to grow into that position and she would have set herself up for failure. And it wouldn't have been believable to HER. I'm not saying anything is impossible! No, no, no! But making $1,000,000 by only doing Bridal Hair doesn't "feel" believable to me. Making $60,000 a year for Paige would totally support her and the kids, make her a success in her mind and is very attainable. That is the beauty career she envisions! 3. Make Your Goals Visual – Let's say Paige desires to be a Bridal Stylist and writes down her goals. She continues working daily in the salon doing everything from cuts to color. Her goal notebook is by her bed but once she wrote it out she hasn't looked at it since. Do you see her reaching her goal by the end of the year? It's not likely. Why? Because she is not "feeling" it on a daily basis and doing specific things to further her down the path of those beauty career dreams. Now let's say she did write down her goals and reads them every morning before getting in the shower. Do you think she has a better chance of reaching them now? I would say Yes. BUT, what if Paige not only read them every morning and every night but she also had a visual image that she saw throughout her day that reinforced her desires? Can you see how this would strengthen her resolve to reach her goal of becoming self supportive as a Bridal hair designer? Whatever we focus on grows! By making your goals visual you engage more of your senses to support the fulfillment of your dreams. I have a background in energy therapy but I have a very logical mind. You are about to benefit from the melting of these 2 forms of thought! Logically we are writing down our goals and providing a visual to focus on. Energetically we are providing laser focused intent on our dreams to increase the energy that makes them manifest. Action plus intent equals dreams realized. So back to the VISUAL Goal Setting! The really fun part of the 8 Moves. We want to have a visual image of our goal to see on a daily basis. If you want to go old school and you are "crafty" go through magazines and cut out pictures to put in your goal setting notebook. On each page you should have one specific goal. Cut out a picture that reinforces the goal and paste it to the page. It would be even better if you had a picture of YOU doing it. 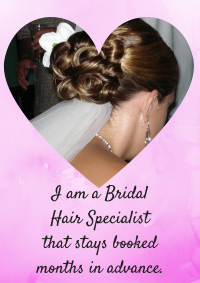 On Paige's page for "I am the best hair stylist in bridal design in Jackson, TN by December 31, 2014" she could have a picture of herself doing bridal hair. Or "I make $60,000 a year doing only bridal hair by December 31, 2016" could have a picture of her checkbook with the balance showing $60,000. As Paige continues to work on her goal setting notebook she is reading it morning and night and actually feeling the sensation of living inside her dreams. From an energetic standpoint, this feeling of "being" a Bridal Hair Stylist puts Paige in an attraction mode, growing the energy that surrounds her desire. And what you focus on grows, remember! New school is more techie but just as effective! Here we are using the same principle of visualization but with smart phones, Ipads, laptops, etc. Instead of clipping magazine pictures, Paige would find images online that support her beauty career dreams and download them to her smart phone and any other electronic device she uses regularly. Use the best pic as wallpaper so that every time you reach for your phone you see your goal! True story: There was an expensive watch I wanted desperately. I would never spend that kind of money on a watch for myself, nor did I want to charge it. I couldn't justify it no matter how I looked at it. I wrote it down in my goal setting notebook then went to the jewelry store and took a picture of it on MY ARM! I set it as wallpaper on my phone. About 6 weeks later it was mine! My husband hit a jackpot out of nowhere and we were able to pay cash for my dream watch. DO THE PHONE PICTURE, FRIEND!! Let's not stop there. I have a few more ideas for you. If you have PowerPoint make a presentation for yourself that you can view daily. That jackpot came 24 hours after I made a PowerPoint presentation about us being showered with money! I kid you not. It was unbelievable! You can use your own pictures in PowerPoint. The more you can see yourself in the scenes the more effective it becomes. 4. Make Goals Visible –We have a page in a goal setting notebook for each individual goal along with a date of accomplishment supported by a visual image. Great work so far! A common mistake of newbie goal setters is neglect. Just go back to last New Year's Eve and you will know what I'm talking about! Ahhh, the old broken New Year's resolution. So many attempts, so many failures. It's easy to make the resolution but we usually forget about it within the week. That's why it's important to our goal setting to make them visible and in our face DAILY so we don't forget about them. Start putting them in the high traffic areas of your life. Using the pics and affirmations as wallpaper is a very good start. Try adding post-it notes to the refrigerator, the bathroom mirror, your wallet, your car's console, etc. We need to keep those dreams alive in our head and hearts. 5. For Each Goal Write Down 10 Things You Can Do To Get You Closer to Achievement– on each individual page write the numbers 1-10. It's not imperative that you fill it all out immediately. Some may take more time and you will find that ideas will come to you randomly. But for every individual goal there are always things you can be doing to work toward that goal. Let's see what Paige's would look like. 6. Keep Your Goal Setting Notebook an Organic Breathing Thing – I don't think there is ever a time when your notebook is "finished." This is something you should work on all your life if you want to be an achiever and maximize your beauty career and even your life. Personally, I use the wallpaper visuals, PowerPoint and Mind Movies, but I will always have notebooks. Notebooks, like journals or diaries are very personal and cathartic. Though we all have electronics there is something special about writing in a notebook. Pen to paper is a connection you make with yourself. You will find, years from now, when you flip through the pages that you achieved more than you thought. You are always growing and developing. Your notebook is a testament to how far you have come. Let it live! 7. Re-evaluate Every Few Months – Things change in life. What you wanted 6 months ago may not be what you want today. When I started beauty school I thought I wanted to be on stage as a platform artist more than anything. A few years later that vision had changed dramatically. The more I found myself as a stylist the more I realized my interests were somewhere else. It's easy to tear that page out and write on another one! It may be that you need to tweak some details. Maybe you want to live in another city or add more action steps to one of your pages. Make sure to comb through (cool pun, huh?) your pages to fine tune your goals. You always want them to be current so your brain knows where to focus. 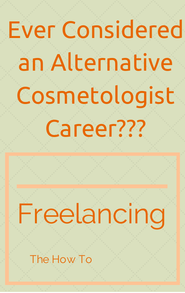 The beauty career of your dreams depends on it! 8. Celebrate your achievements - Isn't it a wonderful feeling to reach a goal!? Why do we celebrate graduations? Because we are rewarding accomplishment! It's a big deal to achieve a goal you set. Set up your own personal reward system. I used to know this interesting guy in college that always drank warm coke. I asked him one day if he didn't like ice. He said, "I LOVE ice." "Then why don't you use it? ", I asked. "Because I love it so much I use it as a reward. If I do something really good I'll put ice in my drink." Wow, what an interesting perspective! You might enjoy a new purse more though. So write on your goal page in big letters the date you achieved it, pat yourself on the back and go purse shopping. You deserve it. This plan will work for any area of your life, though we are only concentrating now on what we can do to maximize your beauty career. To use this technique for other areas of your life simply divide your goal setting notebook into categories like Professional Life, Relationships, Finances, Spirituality, Health. It really is easy! It just takes a little effort on your part. But the rewards are enormous. How important is living your dream? Do a little work now and live large later!